"You can flavor the 'sauce' to taste. I avoided relish due to the sugar content. Whether you add paprika, dill, or relish, the key to this low-carb recipe is the combination of cauliflower and turnips." Combine turnips and 1 tablespoon olive oil in a bowl and toss. Transfer to a baking sheet in a single layer. Roast in the preheated oven until browned and crisp, 30 to 35 minutes. Combine cauliflower and remaining 1 tablespoon olive oil in a bowl and toss. Transfer to a baking sheet in a single layer. Roast in the hot oven until lightly browned on all sides, 20 to 25 minutes. Mix mayonnaise, mustard, vinegar, garlic salt, fresh dill, and black pepper together in large bowl. Toss roasted turnips and cauliflower, eggs, and onion into the sauce. Refrigerate before serving, about 20 minutes. I did not add vinegar, dill nor onion. I would make again. This was my first time making a "potato salad." 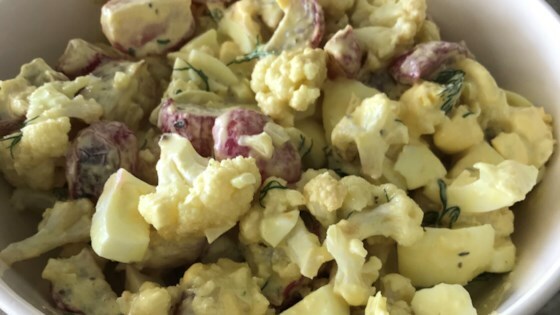 On many occasions I have sampled homemade potato salad, and this recipe easily beats them all.